The Lower East Side in the final decades before the Civil War saw increasing numbers of German immigrants. Before long the district would be known as Kleindeutschland, or Little Germany. In 1846 three lots on East 6th Street were purchased by the Corporation of the United German Lutheran Church for $6,600 from the Woodward and Gaines families. Within a year construction of a new church, intended as a mission for the congregation of St. Matthew’s Lutheran Church at Broadway and Walker Street, was begun. The unknown architect marched to his own tune in designing the building. At a time when Gothic Revival was catching on and Green Revival temples were still the accepted form for church architecture, the architect chose to work in the Renaissance Revival style—much more expected for commercial and residential structures. It would be a red brick edifice sitting on a base of brownstone and accessed by a broad set of brownstone steps. Clustered pilasters flanked the handsome double-doored entrance and two blind windows with brownstone lentils and sills sat in recesses created by plain brick columns. A classical pediment rose over the overhanging cornice. The interior was a no-nonsense space of worship. Relatively unadorned, a balcony ran along three sides supported by slim wooden columns. While the church was being built, the Evangelical Lutheran Church of St. Mark was organized by a few former members of St. Matthews Church. 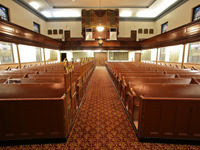 The congregation was formalized on December 12, 1847 and worshiped briefly in a rented hall. Construction on the East 6th Street building was completed in 1848 and the dedication was held on June 4. The new St. Mark’s church, financially unable to purchase the building, rented it from St. Matthews. As the German population in the area grew, so did the congregation of St. Mark’s and in 1857 the church was finally able to purchase the building from St. Matthew’s for $8,000. The congregants established themselves as merchants and skilled laborers, becoming an integral part of New York’s varied populace. St. Mark’s Lutheran Church was central to the lives of many of the families. In 1887 an addition was added to the back as a study or “director’s room,” and two years later the house behind the church at 64 East 7th Street was purchased as a parsonage. As the congregation prospered, renovations including stained glass windows and new altar furniture were installed around 1897. That same year the church listed between 650 and 700 communicants and more than 700 children in the Sunday school. Annual excursions were popular around the turn of the century, sponsored by churches and civic groups. St. Mark’s held an annual boat trip to a picnic grounds each year that provided relief from household drudgery and the heat of summer for church members. On the morning of Wednesday, June 15, 1904 hundreds of women and children lined up at the Third Street Pier to board the steam side side wheeler, The General Slocum. It was to be the seventeenth such trip up the East River and a German band played lively tunes on deck. The passengers would never make it to the picnic grounds. Around 10:00 am a fire broke out below decks that rapidly intensified when it reached a locker of paint and flammable liquids. Life vests and fire hoses had been allowed to dry rot and crewmen were never trained in fire fighting. Within a span of only 15 minutes, the vessel had burned to the water line and over 1000 people were dead – the greatest loss of life in New York City until the attack on the World Trade Center. Kleindeutschland was devastated. Some men lost their entire families. There was not a member of the church who had not lost someone. The neighborhood would never recover. Little by little, unable to cope with the memories, the German population moved north to the Upper East Side Yorkville neighborhood. 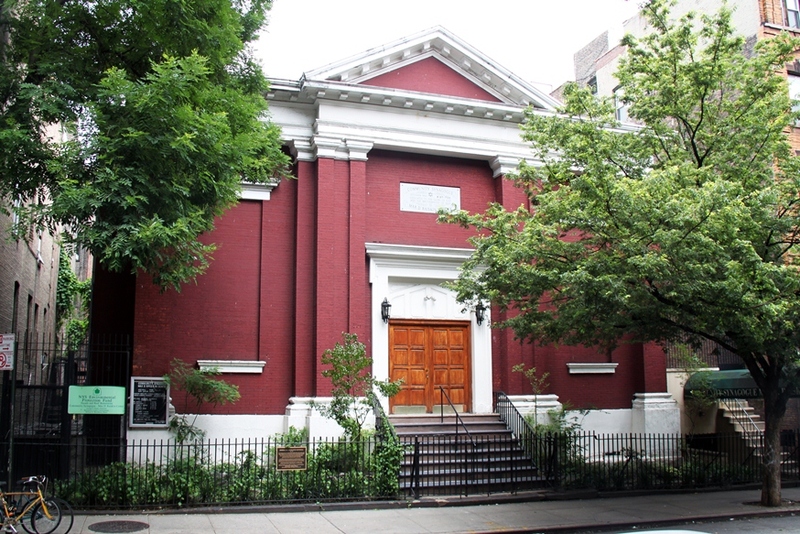 By Christmas Day 1940, however, the church was forced to “fold its skirts.” With fewer than 50 congregants, St. Mark’s had been forced to abandon its venerable East 6th Street home on July 28 of that year and worship as guests of St. Peter’s Evangelical Lutheran Church at Lexington Avenue and 54th Street. Before long the congregation would merge with Zion Evangelical Lutheran Church on East 84th Street. Briefly the church was used by a “Russian Catholic group,” but on January 2, 1941 the Community Synagogue Center, Inc., took over the old church. 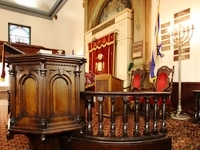 The synagogue had purchased the property the previous September for $27,000. The group, which had 200 members at the time, initiated a $25,000 renovation. The rare pre-Civil War building is very much intact today. 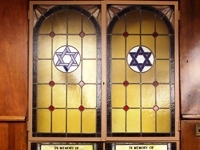 The Sixth Street Community Synagogue remains here after more than half a century and is a vibrant part of the East Village community. While the neighborhood and its ethnic make-up have drastically changed, the red brick church-now-synagogue persists. In the last quarter of the 19th century the once-fashionable Federal-style brick homes in the neighborhood now known as Soho were rapidly being replaced by multistory loft buildings. Small factories, shops and stores filled the new structures; many of which were fronted with popular cast iron facades. On August 25, 1885 The American Architect and Building News noted that Mssrs L. Sachs & Bro. would be building a five-story brick warehouse with “iron front” at No. 26 West Houston Street. The building, which would cost the firm $30,000, was to be designed by Richard Berger. 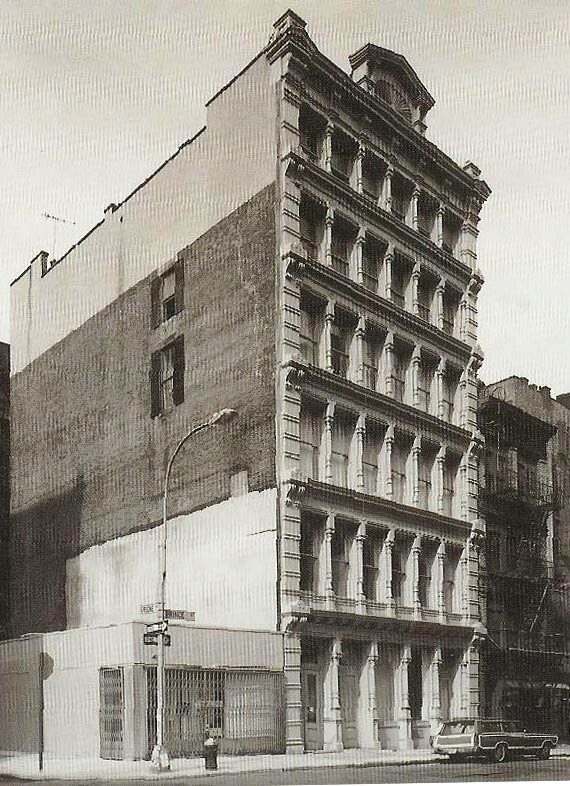 The fur dealers were apparently pleased with the work of their architect because on April 20, 1889 the Engineering and Building Record announced plans by L. S. Sachs for a new building at 112-114 Prince Street. The architect would again be Richard Berger. Berger had designed a clean “neo-Grec” façade not overly-encumbered by ornamentation. Slim, free-standing columns separated each set of windows at all six floors. The architect treated each story identically, but slightly lessening the height of each succeeding floor; creating the illusion of a taller building. While undeniably utilitarian, the structure was light and airy with factory space washed in daylight. Crowning it all was a cast iron parapet with a sunburst motif. Although L. Sachs & Brothers would continue to lease space here; on March 1, 1890 just eight months after the its completion, the fur dealers sold the building for $127,500. Two months later the firm again commissioned Richard Berger—this time to design a retail store at 27-29 West 4th Street at a cost of $170,000. Along with Sachs, other apparel manufacturers moved into the building. Weisl Brothers, cloak makers, was already having problems with the Cloak Manufacturers’ Association in August 1890. Weisl Brothers did not hire union workers, so the Association attempted to compel the firm to advance wages of from 50 to 75 percent to the employees. Mr. Weisl found the advances “exorbitant” and was faced with a strike. Tensions between union apparel workers and owners continued for years. On July 31, 1896 eighty cloakmakers went on strike after being fined 50 cents each for using cotton thread instead of silk in certain garments. (It was common practice for garment workers to supply their own needles and thread as a condition of their employment.) The employees denied switching thread and when a Cloakmakers’ Union representative arrived to examine the garments, he was refused entry. In April 1913 James Thompson & Company leased the entire building “for a long term of years.” The firm manufactured twine, mosquito, netting, tarlatans and buckram (stiff woven fabrics, usually used as interlining). Thompson employed 230 workers and would remain in the building for decades. Around the same time the Garner Print Mill was here printing fabrics; Julius Buchman, also in the twine and netting business, was here for twenty years; and another twine and cordage company, Yazoo Mills leased space in the 1920s. By the 1970s Soho experienced a renaissance as artists flocked to the relatively cheap open loft spaces with sumptuous amounts of natural light. Galleries sprung up at street level and trendy shops appeared. The top floors of No. 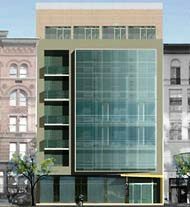 112 Prince were leased out to living and studio spaces for artists, including Maya Lin who created the Viet Nam Memorial in Washington DC. Above the one-story corner building at Prince and Greene Street the crude unfinished brick side wall of No. 112 rose in stark contrast to its white-painted cast iron Victorian façade. Artist Richard Hass, along with a friend, put forward the idea of a trompe l’oeil mural mimicking the Richard Berger façade. With a grant from the National Endowment of the Arts, Hass created the mural which was completed in April 1975. Two real windows were incorporated into the design; and the artist playfully depicted a protruding window air conditioning unit and, in one “open” window, two curious cats. The marvelous work of art was threatened in 2009 when Camper Shoes announced it would be building its commercial headquarters on the empty lot. Since No. 112 Prince sat within the Soho Cast-Iron Historic District, and the mural was considered a “significant feature of that building,” the Landmarks Preservation Commission was entitled to an opinion. Public opinion was also heavily in favor of preserving the mural and the SoHo Alliance; although the problem of the $100,000 necessary to repair the masonry wall and 30-year old mural was another problem in itself. In the end a compromise was struck. Instead of a five-story structure a one-level building was erected. Unfortunately, Haas’ mural is still easily accessible to graffiti “artists” who have slathered the lower level with spray paint. The trim white building put up by fur dealers in 1890 is, unexpectedly enough in New York’s Cast Iron District, the only cast iron building on that block. But its facade, including the street level, is well preserved and the remarkable painting on its blank wall makes it a must-see when in the neighborhood. At the end of the 18th century Manhattan’s water supply came mainly from wells like the popular “tea pump” at the corner of Chatham and Roosevelt Streets. As the population grew the supply was not only inadequate but unhealthful as well. Wells had become brackish and the water impure. 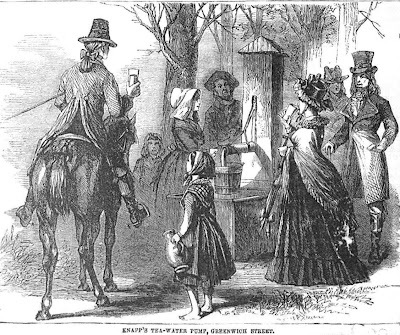 Between 1822 and 1823 a yellow fever epidemic washed across lower Manhattan. Panicked residents fled north to rural communities like Greenwich Village. Businesses and homes stood deserted as deaths climbed to 140 a day. The area below City Hall was deemed “an infected district” and was quarantined by a high wooden fence. A decade later, in 1832, cholera broke out. Between July 24 and October 1 about 3,500 residents died. Aggravating the problem of an insufficient hygienic water supply was the inadequate supply of water to fight fires. The continuing pattern of devastating epidemics and out-of-control fires prompted civic action. In 1831 Dewitt Clinton, who had been a driving force in the construction of the Erie Canal, began investigating the possibility of bringing drinking water from the Croton River upstate. Two years later his recommendations led to a State Commission that conducted surveys and reported in favor of the project in 1834. Work on the system of reservoirs and aqueduct, with a budget of $2.5 million, began in 1837. By the time the system was completed the cost would rise to $12 million. 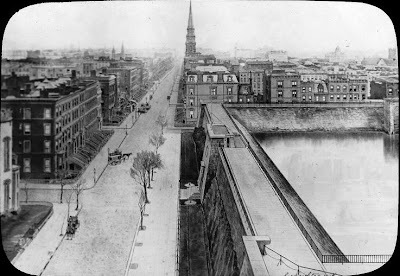 The terminus of the complicated engineering feat was a massive distributing reservoir at Fifth Avenue between 40th and 42nd Streets on Murray Hill – the highest point in Manhattan. The area was named after Robert Murray, a wealthy Quaker whose 18th century country estate had stood here. While the grid plan of streets and avenues had already been laid out, the area was still mostly rolling hills of pastures and woodlands. One of the engineers, James Renwick, Jr., was given the task of designing the mammoth structure. While Renwick had no formal training in design, he would later create architectural masterworks such as St. Patrick’s Cathedral and Grace Episcopal Church. Even now his innate design instincts kicked in and he resisted using the lofty hill with its panoramas for a utilitarian structure. Despite his objections over the site, the reservoir was built. Renwick chose the highly-popular Egyptian Revival style for his structure. Covering four acres of land and holding over 20 million gallons of water, it rose 44 feet from the street. Constructed of massive gray granite blocks it was at once foreboding and striking. 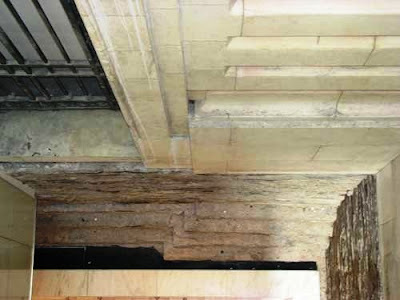 The great walls were hollow to facilitate inspection and the localization of leaks. 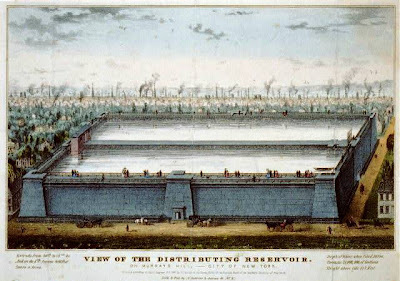 The reservoir – called both the Murray Hill Distributing Reservoir and the Croton Reservoir—was finished in June 1842 and the great mains were opened and water began filling it on July 4th. Three months later, on October 14, water began flowing to the homes of the city. An immense military parade accompanied the event. Households and other users who signed up for the Croton water were charged an annual fee of $8.00. Renwick had designed the reservoir with a wide, spacious promenade along the top rim, accessed by great flights of stone steps. It became a popular Sunday afternoon buggy-ride destination for couples seeking relief from the congested city. The unobstructed view of the rivers, the city below, and the New Jersey palisades were breathtaking. The “dark gray granite” and the “solemn contrast” to the fine homes of New York’s wealthy would eventually be the reservoir’s undoing. The western half of Reservoir Square was “left to waste” as a New York Times article would describe it. Then in 1853 the Crystal Palace was erected behind the reservoir – New York’s answer to London’s World’s Exposition attractive of the same name. Thousands flocked to the Crystal Palace and the Croton Reservoir promenade every day for five years until the glass-and-cast-iron palace burned to the ground in the space of 30 minutes in 1858. 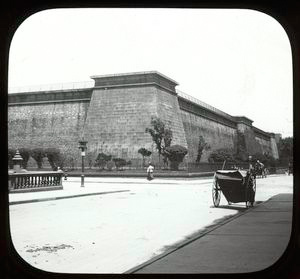 The Croton Reservoir, which had been referred to by developer George Higgins in 1856 as “Oriental magnificence,” was now surrounded by brownstone mansions. To soften the brooding mass, ivy was planted. “Since fashion began to surround its stately site, however, it has striven for most of the year to wreathe that grim front with smiling vines of ivy, and it has grown attractive in its old age to passers-by and to the casual visitor,” remarked The Times. The New York Tribune reported that the Hotel Association quickly met, voting on January 9, 1880 against the removal of the reservoir. But Mother Nature rather than legislation stepped in. That summer the city suffered under a severe drought that lasted through 1881. The situation forced attention on the questionable advisability of removing one of the city’s sources of water. The Egyptian Revival sub-style of architecture never caught on in New York like it did in cities such as Baltimore. 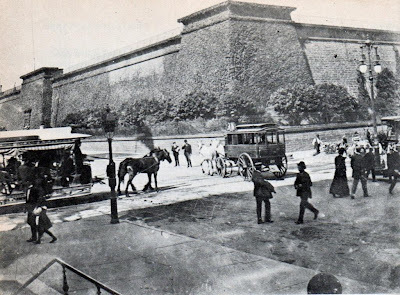 But the two rare examples, the monumental Tombs prison downtown and the Croton Reservoir, were done on a massive scale. Both were obliterated within a year of one another. In 1902 the cornerstone was laid for Carrere & Hastings’ masterful white marble New York Public Library and by the end of the century, few New Yorkers would be aware there ever was a colossal Egyptian structure on the site. But deep in the underbelly of the marble library, the granite remains of the great Renwick reservoir can see be seen. Sergio Furnari's "Lunchtime on a Skyscraper"
On September 29, 1932, in the final months of the construction of the Art Deco RCA Building in Rockefeller Center, Charles C. Ebbets ascended to the 69th floor and snapped a photograph of eleven construction workers eating lunch on a steel girder. There, with Midtown Manhattan dwarfed in the background, the men dangled their feet and casually ate their sandwiches and drank their coffee. The photograph, which Ebbets called “New York Construction Workers Lunching on a Crossbeam,” appeared in the New York Herald Tribune’s photo supplement the following Sunday. It would become one of the most famous black and white images of all time. Decades later a poster of the photograph hung in shop window on Fifth Avenue when sculptor Sergio Furnari walked by. The Sicilian-born Furnari was new to America and the image captivated him. The faces of the workers—mostly immigrants—spoke to him. Furnari started out creating a life-size version of the photograph. The figures were executed in terra cotta, cement, fiberglass and metal. One-by-one the completed statues were welded to an I-beam which Furnari attached to his truck. The work in progress was exhibited around the city, wherever the artist would park. 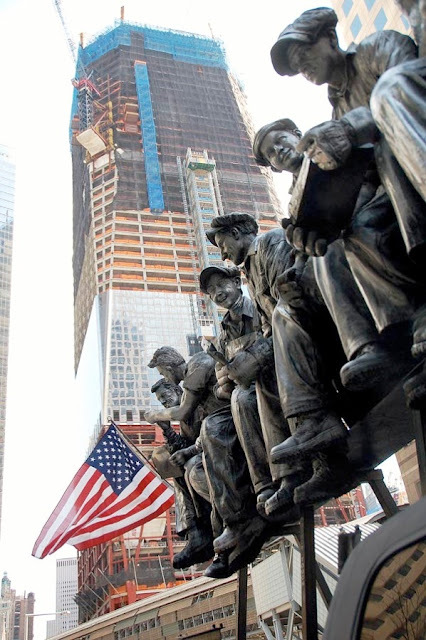 Furnari called his work “Lunchtime on a Skyscraper—A Tribute to America’s Heroes.” That title would take on new significance on the morning of September 11, 2001. The work was nearly finished. Only one figure was left to complete. That morning Furnari and his wife, illustrator Julia Licht, watched the collapse of the World Trade Towers from their apartment window. Within the next few weeks working heroes would have a new meaning for Furnari and his sculpture. The work was completed in October. Meanwhile hundreds of workmen toiled in the still-smoldering ruins of Ground Zero. “The twin towers were made by the ironworkers, and it was the ironworkers that had to remove the whole steel out of Ground Zero,” he later related. 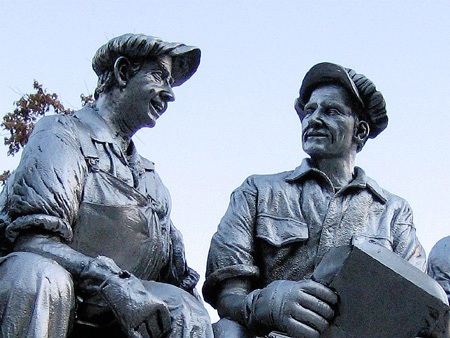 Furnari transported the inspiring work to the site as both a tribute and an encouragement to the workmen. "When they were down in the hole, nobody was smiling. But when they were by the statue, they were inspired, and realized their work was appreciated," he said. The sculpture uplifted the workers for five months. 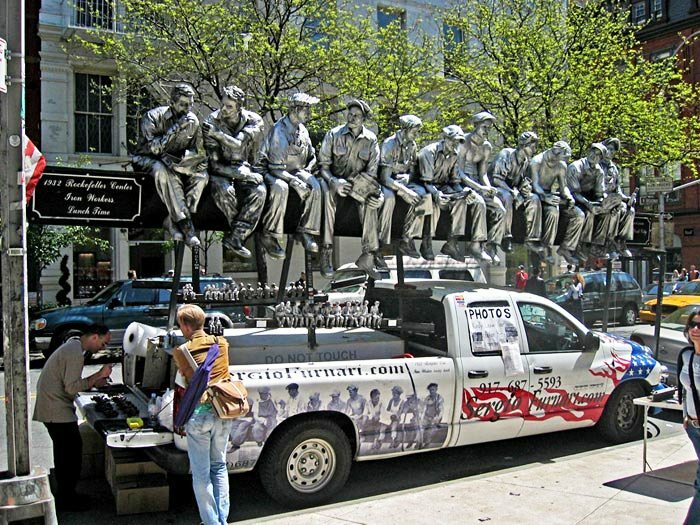 In 2003 Furnari attached the 25-foot, one-ton sculpture onto his truck and set off on a nationwide road trip in hopes of bringing “the American and New York spirit all over America.” He encouraged people across the country who saw the work to sign his truck. Before the end of the tour, millions of Americans had seen the sculpture. Upon its return to the city “Lunchtime on a Skyscraper” became a sort of mobile museum, appearing here and there and always attracting a great amount of attention. Unfortunately, in January 2007 it attracted the wrong type of attention. Thieves broke into the Furnari’s Queens facility and one of the figures was unbolted and stolen. “I feel like they stole a part of me a part of my life,” the artist told a New York Post reporter. The 100-lb. figure was never recovered. Furnari still tours his sculpture around on his truck—a newer one than the one which first transported the work—providing a unexpected delight for New Yorkers an d tourists lucky enough to be in the right place at the right time. Frank Winfield Woolworth worked on his parents’ farm in Great Bend, New York until he was 21 years old. During his last two winters on the farm, when chores were fewer, he worked in a grocery store in town for free, telling the owner he simply wanted the experience. When he finally left home he ventured off to Watertown, New York, where he convinced the owner of the dry goods store Augsbury & Moore to allow him to work free for three months, after which he received $3.50 a week; the exact amount he was paying for his room at a boarding house. By 1878 the 26-year old was earning $10 a week. It was that year that the store in Watertown where he was working installed a revolutionary marketing concept: a five-cent counter. Woolworth took the idea farther. A year later he opened his first store in Utica, New York with $350 worth of goods purchased on a note endorsed by his father. The store failed, but Woolworth was undaunted. By 1911 there were 596 F. W. Woolworth stores and Woolworth had become an extremely wealthy man by selling goods priced at five or ten cents. In 1910 Woolworth began planning a new headquarters building. His initial thoughts of a typical 12- to 16-story office building gradually changed until it would become the tallest building in the world. In the summer of 1911, for about $2.5 million, Woolworth acquired the corner lot at Broadway and Park Place and commissioned Cass Gilbert – known for monumental public buildings like the Minnesota State Capitol building—to design his new headquarters. Mr. Woolworth would get from Cass Gilbert both beautiful architecture and substantial construction. To support the immense structure, estimated to weigh 136,000 tons, 69 concrete piers extended 100 feet down to bedrock. The construction of the foundation alone cost $1.2 million. A billboard announces the coming skyscraper as caissons are driven deep into the earth for the foundation in 1911 photo from the collection of the Library of Congress. On the night of April 24, 1913 President Wilson pressed a button in the White House and 80,000 electric lights in the Woolworth Building flashed on. The building was completed. In the 27th-floor dining room Woolworth hosted a banquet for journalists, business moguls and politicians. Outside, the tower was bathed in light; an early example of architectural illumination. Inside, Gilbert lavished the lobby with creamy marble quarried on the Isle of Skyros in Greece. 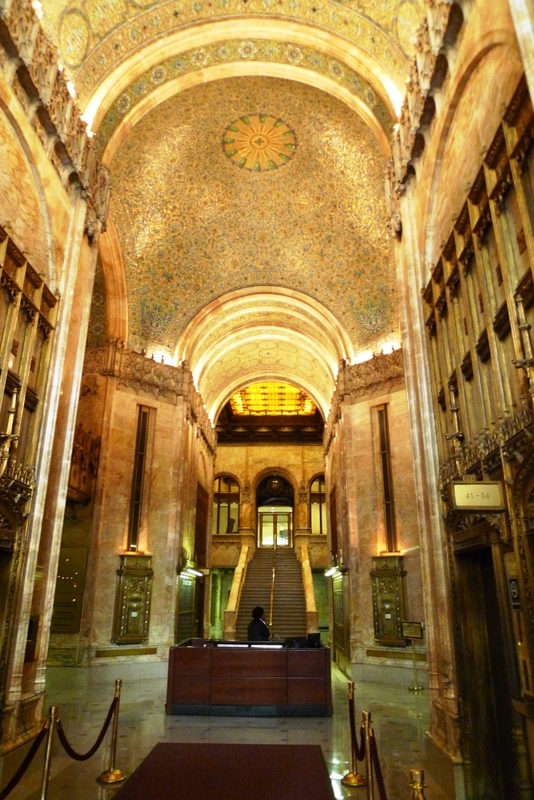 The Gothic curves and arches of the grand corridor rose to the glass-mosaic domed ceiling. The glass was illuminated by concealed lights in the lacy carved marble cornice. Gilbert playfully represented real people in the grotesques below the cornice—the architect himself was represented holding a model of the building, Woolworth has a bag of nickels, engineer Aus holds a steel beam, and rental agent Frank Hogan, building Louis Horowitz and banker Lewis Pierson were also portrayed. Woolworth leased out much of the building where 12,000 workers would come and go every day. The Irving National Bank and the Broadway Trust Company occupied the first floor. In the basement were the “Postkeller,” a restaurant with frescoed, vaulted ceilings; an enormous barber shop; a Turkish bath and swimming pool. But the Woolworth offices were dazzling. Frank Woolworth’s private office was decorated in the Renaissance period. A Flemish Renaissance tapestry woven around 1650 hung over a velvet-covered bench raised on a platform a step higher than the floor. A carved stone Italian Renaissance mantelpiece filled the height of the room at one end and an elaborate coffered ceiling hung over Woolworth’s centuries-old desk. The President’s office was referred to as “The Empire Room.” The walls were executed in various colors of marble. Period French furniture was complemented by an enormous portrait of Napoleon. The Otis Elevator Company quickly used the building in its marketing scheme. Ads boasted of “The marvelous vertical railways in the new Woolworth Building that are to ‘whiz’ the army of workers up with lightning speed 726 feet in the sky in absolute safety and comfort.” In fact, safety was a major consideration of Woolworth when planning the elevators and he was personally involved. Two of the elevators, which ran from the lobby to the 54th floor, were the fastest elevators in the world, traveling at 700 feet per minute. A messy law suit was filed two months after the building opened. The building managers, Broadway-Park Place Company, had given a monopoly to the Virginia Bear Water Company to supply drinking water to the tenants. When some tenants like the Friesdedt Underpinning Company chose to buy from the Pine Hill Crystal Spring Company instead they were forbidden to use the elevators to transport the five-gallon bottles. Office workers were forced to carry the bottles from two to thirty-seven flights of stairs. Because Woolworth owned the building outright, his heirs were assessed inheritance tax of $3 million on the property. In June 1920 they obtained a mortgage in that amount—the first mortgage carried on the building—from the Prudential Life Insurance Company of Newark. Four years later the F. W. Woolworth Company obtained ownership. Thomas E. Dewey established his offices here and, when he began his investigation into racketeering and organized crime in Manhattan, things got lively. Dewey’s offices housed extensive files on mobsters as well as the identities of informants and witnesses. Other office workers on the floor became accustomed to seeing police officers assigned to the hallway outside Dewey’s offices 24 hours a day. Still, in 1977 the Woolworth Company initiated a restoration program to repair the badly weathered and deteriorating terra cotta. A detailed inspection revealed that there were no structural problems and that only the cladding needed attention. In the course of restoration, all 4,400 windows were replaced with aluminum, energy efficient replicas. 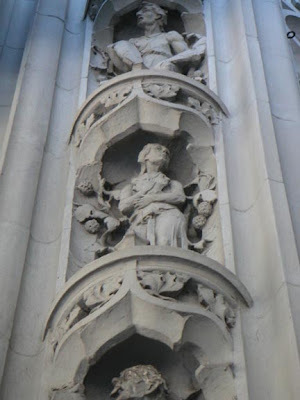 Terra cotta elements were duplicated in cast stone and fiberglass; upwards of one-third of the original material. As the 19th century drew to a close the blocks on Broadway just above Grace Church saw dignified old mansions razed for commercial buildings. On September 28, 1895 Jacob Hirsch purchased the two lots at 832 and 834 Broadway, only to resell them a month later “at a profit” to a builder. By the next summer the existing structures had been demolished and the foundation for a large, speculative loft building was being excavated. Jacob Zimmerman was the contractor. When Zimmerman’s crew reported to work on Monday June 16, 1896, they noticed that the severe rainstorm of the night before had washed out the earthen walls and undermined the sidewalk. Later in the morning, several workmen and three passersby were on the sidewalk when it collapsed, plummeting them all ten feet down into the job site along with a row of planking. Fortunately, no one was seriously injured. Despite the incident, the building was completed within a year. Ten stories tall, it was an elaborately decorated brick and limestone structure, much in the style of architect Louis Korn. 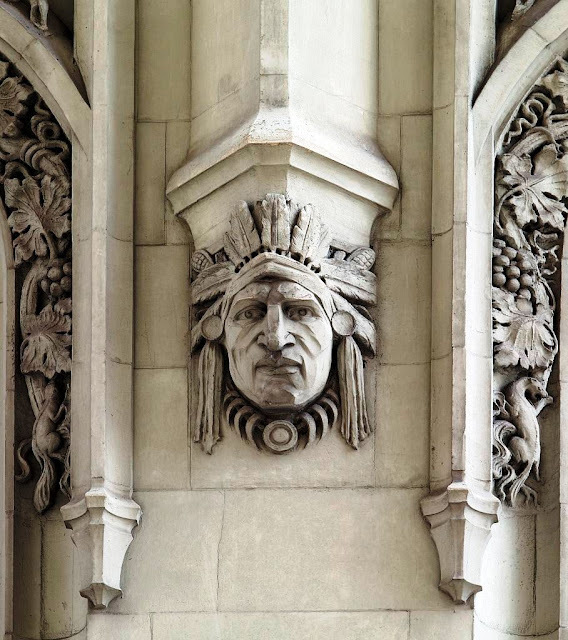 Carved swags, urns, and classical designs embellished the pilasters, spandrels and sections between floors. The classical treatment of the two entrance doors flanking the retail space were reflected similar framing and pediments of the two balconied windows of the fifth floor. Beneath the overhanging copper cornice were five large carved torches at the tenth floor, symbols of learning and education. Bauman & Sperling, makers of cloaks, employed several hundred workers here in 1898. By the turn of the century the tenants were somewhat more diverse. Although, in 1907, apparel manufacturers like Lewine Brothers which made neckwear were still represented, other industries were leasing space. Murphy & Ronan were makers of wagons, Max Kurzrok ran his real estate business here and the Decorative Plant Company, as the name suggests, manufactured artificial plants. One of the more interesting tenants was the National Free Labor Association which had offices here for several years. While the name suggests a labor union or Socialist organization, the association instead lobbied hard for state's use of free convict labor, especially to construct roads. Its first publication issued from No. 832 Broadway in 1913 was entitled “Road Making by Convict Labor.” A year later a 50-page bulletin was issued including an article by Julian Leavitt titled “Good Roads and Better Men.” Leavitt insisted that road gangs would not only enhance the public transportation system, but would be good for the convicts. The association’s efforts were not in vain. The road gang was a common method of road building for decades, especially in Southern states. Throughout the next decades the building would be home to assorted apparel manufacturers; The Big Four Manufacturing Company, Goldstein & Levy, and Ashland Textile among them. By the time Hearn Broadway Builders, Inc. sold No. 832 Broadway in July 1949 to the Rorgan Realty Corporation the building had been combined with the 11-story building next door at No. 830 Broadway. When Max B. Cane bought in 1956 it was already home to a Communist printing house. New Century Publishers were here, called the “official Communist publishing house,” and publishers of The Daily Worker. When the Internal Revenue Service seized books and manuscripts from their offices in the Spring of 1956, the Communist party sued in Federal Court for their return. It may have all been too much for Max Cane, for within a year he sold the building to a group of investors. The New Century Publishers remained in the building into the 1960s, co-existing with garment and accessory manufacturers. In 1982 No. 832 Broadway was converted to luxury cooperative apartments, one per floor. Where neckties and trusses were once made and a Communist newspaper was printed, now wealthy residents enjoy 4,500 square foot living spaces. The sumptuous façade of No. 832 Broadway, including the street level, has been well-preserved; part of the architectural feast along this stretch of Broadway. During the 1920s cafeterias and automats reached their height of popularity among working class New Yorkers. Secretaries and salesmen enjoyed inexpensive lunches in clean, attractive surroundings. Wil-Low Cafeterias, Inc. ran twenty-two cafeterias in the city during this time. A subsidiary of the organization was The Traffic Cafeteria Corporation. The name came, most likely, as a reflection of the deliverymen and truckers whose patronage it sought. “Traffic” during the first part of the 20th century also referred to the trucking industry. In 1927 the corporation hired often-forgotten architect Abraham Fisher to design a new cafeteria and loft building at 163 West 23rd Street. By now the area in what had been just two decades before The Ladies’ Mile—a fashionable shopping district—was a hodge-podge of commercial buildings and converted brownstones. It was a bustling neighborhood ripe for a new lunch spot. In designing what could have been a small, nondescript lunch room and office building Fisher outdid himself. His resulting structure was six-stories of brown brick and terra cotta so creatively conceived and executed it demands attention. Brick was laid out in a parquet-like diamond pattern; a large terra cotta panel announces the TRAFFIC BUILDING, flanked by terra cotta tiles with lush foliate designs; and two standing eagles perch atop the capitals of pencil-like swirling four-story columns. One of the first short-order cooks at the Traffic Cafeteria was Chick Gum. On the morning of April 16, 1929 he caused an uproar when a customer asked for a plate of flapjacks. Mr. Gum poured the batter into the hot, greased frying pan and, when the time came to flip the flapjacks, he gave the skillet a quick flick of his wrist. Outside, Police Officer George Leonard heard a loud scream and rushed into the cafeteria with his pistol drawn. There, in the kitchen, he found Chick Gum. One of the scalding hot pancakes, rather than flip back into the pan, had dropped into the cook’s open shirt. The unfortunate cook was treated at Bellevue Hospital and sent home. The unhappy episode of the cook and the flapjack was the least of the cafeteria’s problems in 1929. In the Spring of that year a city-wide strike by cafeteria employees threatened to put an end to the Traffic Cafeteria. One morning in May about 15 union laborers entered the cafeteria around 11:30, just before the lunch rush hour. The men threatened workers and prevented customers from entering. The League described the methods used by the group. “The course of conduct of the strikers has been such as to indicate the danger of injury to property,” thus intimidating the cafeterias to close rather than suffer expensive damage. The strike was over before the end of the year and in March 1930 the Traffic Cafeteria, Inc. purchased its building, which it had until now been leasing. There would be more problems with the unions, however. In 1933 the mob demanded that William Lowenstein, who owned the Wil-Low chain, pay “protection” money to keep the unions at bay. The manager of The Traffic testified four years later that he paid a mobster named Kranz $2000. After the payment pressure on The Traffic Cafeteria from Local 110 of the Amalgamated Food Workers Union abruptly stopped. Not long afterwards, however, The Traffic Cafeteria ceased operation altogether. In June 1942 the building was leased to the Comet Express Company. From the mid-1940s through the 1950s Standard Phono Corporation, distributors and sellers of vinyl records, was here. Today, appropriately, the first floor is home to a diner. Unfortunately the street level has been completely obliterated; modernized with tacky stone tiles where once were decorative terra cotta and brick. 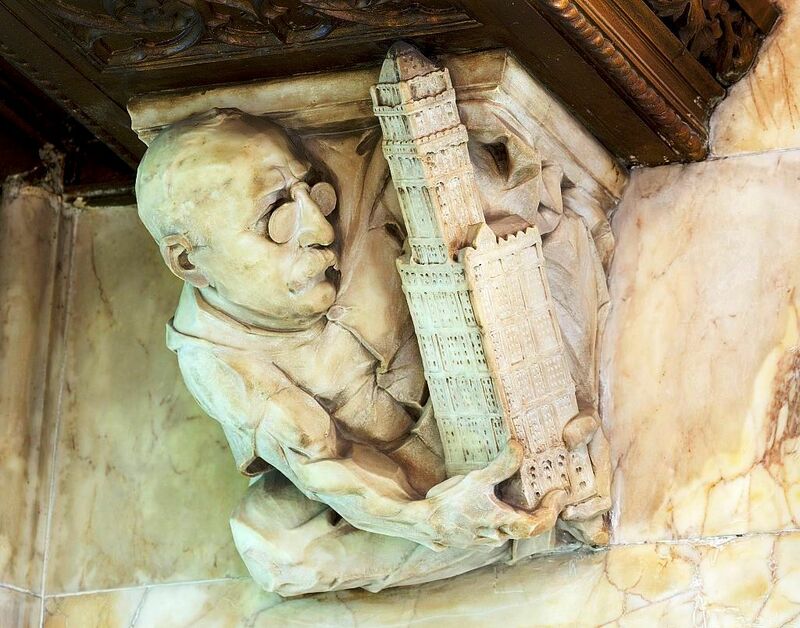 But above this, Abraham Fisher’s intricate design is wonderfully preserved. A marvelous little building with so much detail that the passerby has to pause to soak it all in. many thanks to reader Simone for requesting this post. 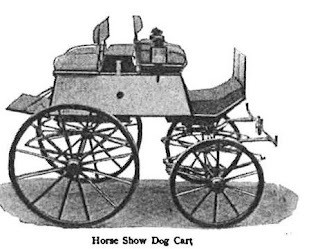 To the 21st century mind, Victorian horse-drawn transportation were “carriages.” But just as we differentiate among SUV’s, sedans, convertibles, sports cards and minibuses, the turn of the century buyer purchased vehicles specific to his needs. 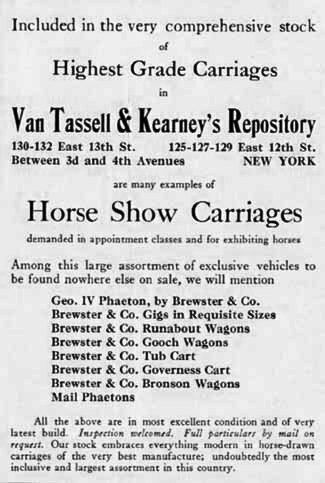 Van Tassell & Kearney sold various vehicles including "gooch wagons," tub carts," and "governess carts." Van Tassell & Kearney operated from buildings at Nos. 130-132 East 13th Street and Nos. 125 to 129 East 12th Street. In February 1903 two four-story brick buildings at Nos. 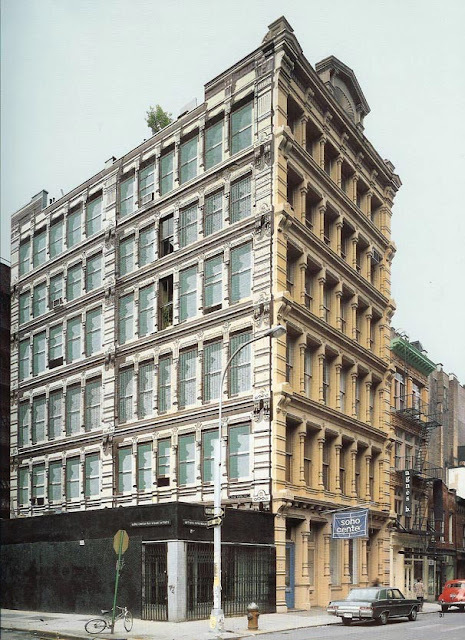 126 and 128 East 13th Street became available at auction and were purchased by John J. Sullivan. The cleared lot would become an adjoining showroom and auction space for Van Tassell & Kearney’s Auction Mart. Completed in 1904, the masculine, utilitarian structure was designed by the prominent architectural firm of Jardine, Kent, and Jardine. Constructed of red brick and contrasting limestone, it was a brawny mass with Beaux Arts splashes – the visual focus being a large central arched window embellished with a carved cartouche. 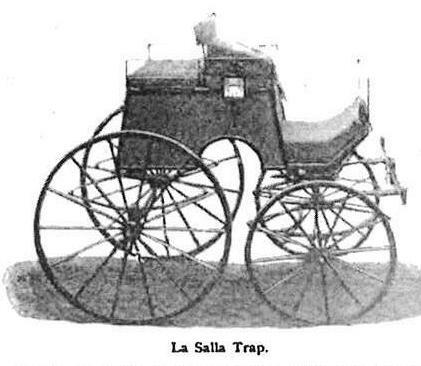 Van Tassell & Kearney’s not only sold to New York’s most elite – among them buyers with names like Belmont, Vanderbilt and Mackay – but they were trusted by the wealthy to sell their own stock. On March 13, 1906 some of Dr. Woodend’s geldings were among the 24 horses auctioned at Van Tassell & Kearney’s; the total sale amounting to $11,250 – more than a quarter million dollars today. The prediction, of course, was not to be and before long the venerable auction house that refused to adapt to change was no more. In 1978 artist Frank Stella took over the building, using it as his studio for 27 years. It was from here that the influential artist added free-standing sculpture to his painting and print-making art. In 2005 the building was sold to Isaac Mishan for $10 million. Mishan planned to demolish the structure to replace it with a seven-story sleek condo building. Preservationists rushed in. By September 3, 2006 the developer had construction permits in hand, but demolition permits had not be issued. At an emergency meeting of the Landmarks Preservation Commission the next day, politicians including State Senator Tom Duane, Assemblywoman Deborah Glick and Manhattan Borough President Scott Stringer pleaded to save the building. Local residents joined representatives from the Greenwich Village Society for Historic Preservation, the Municipal Arts Society, and the Metropolitan Chapter of the Victorian Society in America in the appeal. Although to this day the Landmarks Preservation Commission has not designated the structure, the owners were swayed. They voluntarily allowed it to be listed on the State and National Registers of Historic Places, giving up the right to alter the exterior or build on it in anyway inconsistent with historic preservation guidelines. In exchange they received a substantial tax write-off. In 2007 the Peridance Center leased the building and began a nearly three-year renovation. When opened in December 2009, it housed six roomy climate-controlled, soundproof dance studios, a 200-seat theater for the Peridance Contemporary Dance Company, a café and boutique. The handsome old auction house where Belmonts and Vanderbilts shopped for show horses is a faultless example of creative recycling of historic properties.